2089 Ponce de Leon Ave.
1. Call to Order and Welcome: Frances Finegan, PGC President, called the meeting to order at 7:02 P.M. and welcomed the membership to the annual meeting. Frances highlighted two objectives for the meeting: reviewing the accomplishments of the 2013-2014 PGC Board and voting on the members of the Board for 2014-2015. 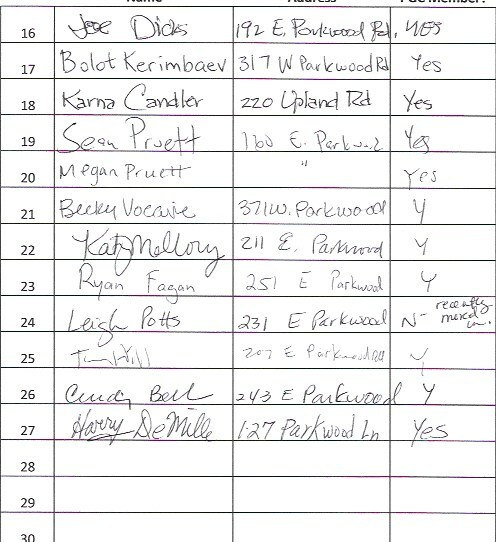 The sign in sheets for the members who attended the meeting are attached. 2. Treasurer’s Report: Bob Stewart provided an overview of the budget and it is attached. k. Welcomed 10 new families into our neighborhood. 4. Remarks from Members: A neighbor asked about the status of railroad crossings on East Lake Road and other nearby roads. He was encouraged to review information on the website, http://www.eastlakeneighborhood.org, and to contact Aja Pascale (Aja.Pascale@outlook.com) for additional information. Anne Dicks asked neighbors to contact her (annedicks@gmail.com) when they become aware of neighbors in need of words of comfort, welcome, encouragement or congratulations. 6. Frances adjourned the meeting at 7:22 P.M.
After the meeting adjourned, Frances informed the membership that she had inadvertently forgotten to mention that other neighbors had volunteered for activities in the neighborhood: Anne Dicks for Neighbor Care, Joe Dicks for support of the Powl Logo, Bryan Bell as Webmaster and Karna Candler for Crime Prevention.